Yet another Samsung Galaxy Note 7 phone has exploded in a public place—an airport, in fact!—in the wake of an official recall from US regulators last month. 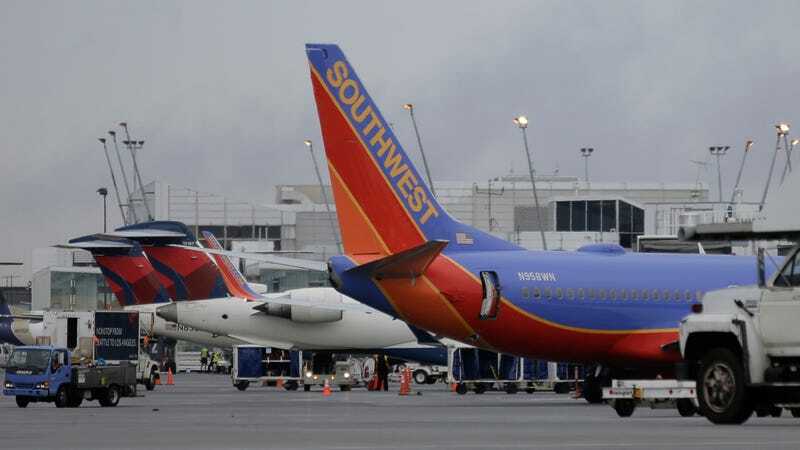 The latest incident of an exploding Note 7 phone happened during the boarding process of Southwest Flight 994 to Baltimore at Louisville International Airport on Wednesday. The worst part: it was a replacement Galaxy Note 7. Officials say the Galaxy Note 7 overheated as people were boarding the plane, and the smoke caused the entire plane to be evacuated. More than 75 people were asked to deplane including the crew members. No one was injured during the incident. According to a report from The Verge, the owner of the phone confirmed he had replaced his faulty Note 7 at an AT&T store on September 21. A photograph that the owner sent to the news site shows a black square symbol on the box that is supposed to indicate a replacement Note 7. The phone was powered down and in the owner’s pocket when it exploded. The Galaxy Note 7 caused minor damage to the plane’s carpet, where the phone was dropped. The incident comes in the wake of the US Consumer Product Safety Commission (CPSC) formally recalling 1 million Galaxy Note 7 smartphones last month. According to the CPSC, Samsung received 92 reports of batteries overheating in the US, resulting in 26 instances of property damage. As Gizmodo previously reported, it’s not that easy to exchange faulty Galaxy Note 7 devices. Our readers have written dozens of emails to me complaining about how difficult it is to exchange the device through third parties such as Verizon. In addition to facing difficulties getting the bad phones replaced, the Wall Street Journal reported that replacement phones are also overheating. Our only advice to Note 7 owners is to get your faulty device replaced immediately, and at this point, you may want to consider selling the phone for something better like the Google Pixel or iPhone 7. If you still have a faulty Galaxy Note 7 phone, please, for the love of freaking God, go exchange it right now. And pray that it doesn’t explode. Do that or just switch to an iPhone 7. Is your replacement phone getting unreasonably hot? Do you have other important intel about Flight 994? Let me know by messaging me at michael.nunez@gizmodo.com. Update 5:31pm ET: The US Consumer Product Safety Commission chairman Elliot F. Kaye has released an official statement about the incident. Update 5:43pm ET: Samsung has has also issued an official statement published by Recode. Here is the full statement.